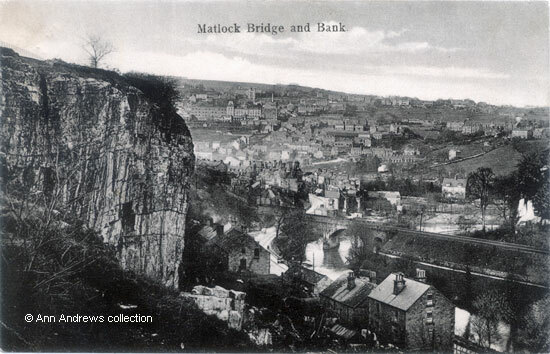 An unusual view of Matlock Bank and Bridge, photographed from just past the Harvey Dale Mountain Limestone Quarry which belonged to Job Greatorex and Son. Look carefully at the top of hill above the rock face (against the edge of the picture); there is a long line of fencing. The buildings below, next to the road and including the former Boat House Hotel, are dwarfed by the immense rocks. The Dale Road buildings on the far side of the railway bridge seem awash with turrets and chimneys. Holt Lane is just about visible, beginning under the bridge - a few feet past the vehicle on the road. There was only one property on Old Derwent Avenue at this time. Behind that building is Steep Turnpike, at the top of which is Chesterfield Road. Lilybank and Dalefield (The Gables at that time) can be seen, with fields and open countryside behind them. Above the Dale Road shops is Lime Grove Walk. Bank Road and Smedley's Hydro are easy to see and Rockside also stands out. On the far right of the picture is a large field bordering Steep Turnpike which ran almost the full length of the road (enlarged below). This was numbered 897 on the 1848 tithe map and its owner and occupier was shown to be George Nuttall (Dale Hill and Hovel, pasture). There was another piece of land surrounded by the field, No.898 on the tithe map and today known as Harley House, which also belonged to George Nuttall. The occupier was John Else (House, courts and garden). Mr. Nuttall also owned The Firs - now the library - which he had inherited from his mother and a considerable amount of other property in the town and elsewhere. Following his death in 1856 these two parcels of land were listed in his Will, alongside several other fields. He had left them to his housekeeper Catherine Marsden, who was his cousin, and after her death to John Nuttall of London. They crop up again in a detailed purchase document of 1876 when Lindsey Hodgkinson of Matlock was buying some of the Copyhold land from the estate of John Nuttall. At some stage after these pictures were taken there was more building development on Steep Turnpike. The two images on the previous page were taken from a similar position and also shows the field. Enlargement, showing the field next to Steep Turnpike. "The weather here is very rough and stormy, plenty of rain. I was just going to pick some Bilberries on the hillside and it is raining again! .." Another version of this card was posted in 1907. See the 1848 Tithe Map, Derbyshire Record Office. With thanks to Susan Tomlinson for checking. Information from the PCC Will of George Nuttall, with two Codicils. The Codicils were disputed by the Nuttall family. See The Great Matlock Will Case : The Court Report | The Great Matlock Will Case - 100th anniversary article | Nuttall Pedigree. From Douglas family archives, with thanks to Jean Douglas.